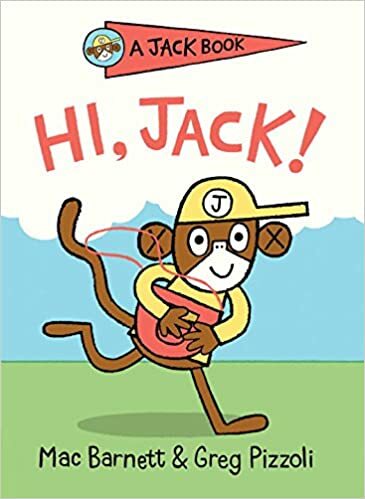 Summary: Jack is a mischievous monkey in this three-chapter beginning reader. In the first chapter, he steals a woman’s purse and puts on some lipstick. The second chapter starts out being about Rex the dog, but when Rex’s lips suddenly turn red, Jack is revealed to be the culprit. The final story takes place at the woman’s house (she’s known only as The Lady). Jack shows his hands to convince her that he doesn’t have any lipstick; meanwhile, he’s writing his name on her wall with a lipstick held by his tail. There seems to be the beginning of a friendship when The Lady offers Jack a cookie; Jack reciprocates with a kiss…but his version (involving Rex) is a little different from what she is expecting. The final pages show how to draw Jack, Rex, and The Lady. 80 pages; ages 4-8. Pros: Behold, the first book of 2018, from an advance reader copy I picked up at AALS. The pairing of Mac Barnett and Greg Pizzoli is kind of genius, and I predict beginning readers are going to love this series. The first two entries are scheduled for February, with two more to come in May. Cons: It’s a lot of pages for a beginner.